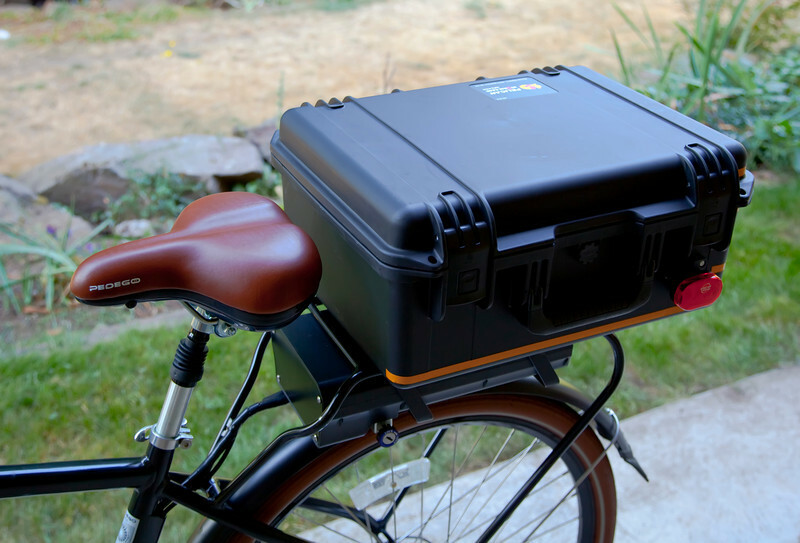 This gallery is to show off the trunk I setup for the back of my Pedego City Commuter. I bought some Pannier Hooks on Amazon which I mounted to the bottom of the Pelican Storm Case. It has really worked out as a fantastic solution! BTW, I am very high on the Pedego company and the Classic City Commuter bicycle. Here are some links about the bike: Pedego Company Website My full review on Amazon I am taking pictures and posting remarks about what I am learning as a daily commuter. The front door to the topics and galleries is called BICYCLE ADVENTURES. Pelican IM2450 Storm Case mounted as a trunk on the back of my bike. This has turned out to be a great solution for my needs. In this picture it just looks HUGE, but in the next picture where I am riding the bike it doesn't look like that at all.